Give first adds value to your customers and business - Brilliant Breakthroughs, Inc.
Do you Give First? If not, You’ll love this simple and powerful strategy. Give first is a life lesson most of us are taught as children. The adults who remember to give first in business are light years ahead of the their competitors. Why? This, unfortunately, is still an unique practice. The practitioners, who give first, are boosting their business’s performance through this very basic strategy. Are you gaining business through this approach or are you leaving it for others to “wow” your customers? In our last post, I shared the power of YOUR Business’s Customer Journey and discussed the importance of you continuously working to improve upon it. Every time you “give first” you are boosting your business’s visibility and your earnest to build relationships. Boosting YOUR Business’s visibility isn’t anything new. However, giving first is still a differentiator in most marketplaces. It breaks my heart to say this, but it is still the truth for most businesses. Are some businesses understanding this? Yes, but not enough! NOTE: All the Businesses, who are doing opt-ins are doing this. It’s a common way to do it with the masses. Now, let’s move beyond that. What about all the people you meet and/or want to do business with – either as Business Allies or as YOUR Customers. What are you doing with them? This approach will help you shine brilliantly! Does the Give First approach work? If you’re already giving something to add value, you already know the answer is a resounding “Yes!” If you haven’t experimented with it yet, you may not believe the power it holds. How many people give you something for the sheer joy of giving you something – no strings attached? That, is where the magic happens! REMEMBER: The key is to give something they will consider valuable. FYI: In sales and marketing there is an acronym, “TNT”, which stands for Trinkets and Trash. This is not what I’m referencing when we discuss something that adds value. Take the time to think what YOUR Customers, or potential customers, will find valuable. It doesn’t need to relate to what you do. Example: If I conducted business in a climate that is known for it’s rain, I might gift umbrellas. Umbrellas have nothing to do with my business, however, they may be valuable to my marketplace. This is the type of creativity I invite you to consider. Schedule 45 minutes on your calendar this week of next to do some creative brainstorming (even if it’s just you). To explore what possibilities may work well for YOUR People, their businesses, and yours too! Don’t hesitate on this! It’s very easy and you can start small if you need to for now. The photo for this post reflects one of the ways, myself and our authoring team (Stacy Kaat, Nancy Luchessi, and Susan McCuistion) show up. We were at the eWN Summit in Milwaukee about 10 days ago. 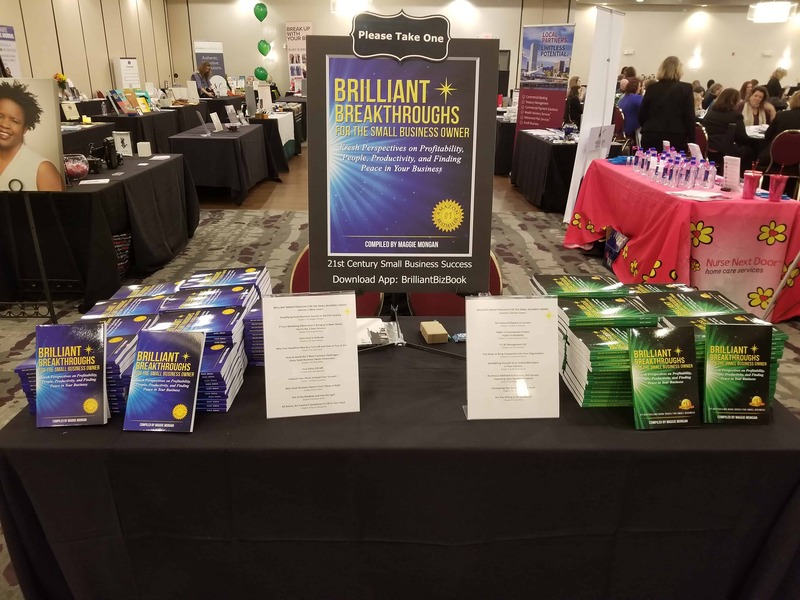 Both volumes of our #1 Bestselling Book Series for Small Business “Brilliant Breakthroughs for the Small Business Owner” were available. We were giving them away to every attendee – almost 200 women entrepreneurs and professionals. Our intention was to have it be a 100% Give First. Since each of us is highly active within this particular community, we didn’t even capture their contact information. Why? They all have our cards and valuable information to successfully guide their business. It was 100% give. Make sure you schedule your 45 minutes to determine how you’re going to shine brightly in your marketplace. Have fun and enjoy giving!